Here’s Day 1 of the Saint Therese of Lisieux Novena! And i’m glad studying your article. However wanna remark on some general things, The website taste is great, the articles is actually great : D.
I am praying for complete healing for baby Aidan Gleason. Please pray for Bob who is struggling with his health. Pray for all those struggling with addiction. I love you, praise you with all my heart. Thank you Lord for everything you’ve done to us in this world. You’re our omnipotent, our redeemer, saviour, healer,. Lord Jesus thank I love. In your name amen. Please Pray for me and my sons, to have a trusting, and loving relationship with each other and God the Father. I pray that their earthly Father wants the same for us. I pray for my son Sean to come back home to me and enjoy his last year of high school before going off to college. I miss him so much, please hear my prayers. Help me to love you more Jesus, Help me to trust you more Jesus, and all the Saints in heaven. These are my intentions, with the Power of the Holy Spirit come into my life, I will make you my Lord and Savior. Dear Lord, thank you for everything. I’m grateful to you for working on me, my spouse and my marriage. Please be with me always and help me get rid of my deep rooted fear, anxiety and anger. Please keep my spouse in the spiritual path and help him stay on the right path always. In you I trust, gratitude for everything,y dearest Lord. Please cure my hair fall problem as well. Please help reunite my family. ???? I humbly ask for prayers for myself to be completely healed of my eye twitching and facial spasms . And that my surgery with Dr Raymond Sekula was a success. I also asked that my AIC account in my blood be lowered to 5.5. And my blood sugar be lowered. . I asked support to make healthier choices in my life and my diet and exercise that I find the will to stay healthy. St. Therese, please pray for the healing, reconciliation and reunion of our marriage, our family, our hearts, faith, love and trust in accordance with the will of The Heavenly Father! In the name of Jesus, I beg for your intercession! St Theresa please pray for my brother Phillip to stop abusing alcohol..My sister Judy to have her debts paid off. Praying for the grace of conversion for TS, that he find release from anger and anxiety and become willing to seek help; for my daughter and her children, that they can be reunited as a family if that is God’s will. I pray for all those affected by Hurricane Maria in PR. I pray for the wellbeing of my family and friends. I pray for peace of mind and for my father and mother’s peace of mind. I pray that while life continues to get exceedingly difficult for me, that I may be rewarded with the simple joys that make the entire journey worth living. I pray for my family and I pray that God may lead me toward the right path to find an appropriate husband with whom to start a family. God, you know my heart; I place my trust and have faith that my soul will be at peace knowing that all my problems will be taken care of because I will place them in your hands. Dear St. Therese of Liseux, please pray for me to Jesus that my husband will know God soon, miraculously and embrace God through catholicism. Please pray for my marriage which you also helped evolve right from the beginning that God will have mercy on my marriage, heal my marriage, free my marriage from the clutches of the devil and heal my marriage. We have a house for sale that we do not live in. I want to do good. I want to give to the church. However, this house is limiting what we can do. I want to pray that this house sells soon. Also, for the strength to use extra money we have to give blessings to others and not be selfish with it. St. Therese, please help my grandson change his life around and see the light. He will be in prison for the next 4 years. A young man that would have a lot to offer if he could be touched by the grace of God. I have not been able to reach him with my wishes for him. I also pray for my whole family, that they too become more faithful to God. And a special asking for cousin Mark. A fine religious man, husband, father and friend to all. He has such a deep faith in God. He is dying. And caring his cross with such grace. If he cannot have a healing, please ask that he not suffer. Thank you St. Therese and God. Amen. JESUS AND MARY I LOVE YOU, PLEASE SAVE SOULS…….. I pray for The souls in purgatory, especially my family and my deceased daughter, for the conversion of sinners, Holy father’s intentions, and all people that need prayers and for victims that were involved in the hurricanes. I also pray for my sister-in-law who has been diagnosed with breast cancer and that the doctors can arrest this horrible cancer, amen. Pray for the man I love and I to overcome our differences, grow closer to Christ, to one another and have a blessed holy marriage. Please pray formy problema in marriage, for my husband. For my mother and my kids. For the whole world. Thank you. Please pray for me so that i will be the kind of christian Christ wants me to be, for my youngest son to be obedient, have respect and manners to me and that i can be a good parent and an instrument of light for Christ. For the conversion of Jimmy and also that we set our wedding day soon. Dear St. Therese i pray that i will be able to find a good husband. I also pray for the success of personal and professional pursuit. Blessed mother. St there’s I place my financial needs into your hands. I pray that you would bless my finances . Mother of the little flower ,I pray for money to finance my son throughout medical school. please pray that my colonoscopy will show no cancer on Tuesday, 9/2617. Success in Studies for Sarah. Please prayer for my daughter, Eve. I pray that (1) help will come to all people affected by recent hurricanes/disasters; (2) Bill’s blood and work problems may be solved and (3) that Dr. Anderson will determine cause of my debilitating disease so that it will not get worse. To become holier in my life. For my marriage to endure and become even stronger. My husband and son return to the Sacraments. For my daughters N and C to marry strong Catholic men. For my 3YO daughter to toilet train. It sounds trivial, but she recently received a preliminary autism spectrum disorder diagnosis, which makes it even harder for her to master this skill. The local school district has a special preschool she can attend which would be a good fit for her to get needed services, but she cannot attend until she is toilet trained. I don’t want to push her but I do want to be able to get her access to these services in the preschool environment so she can really blossom. Thank you. Please pray for my marriage and husband also peace within our family. 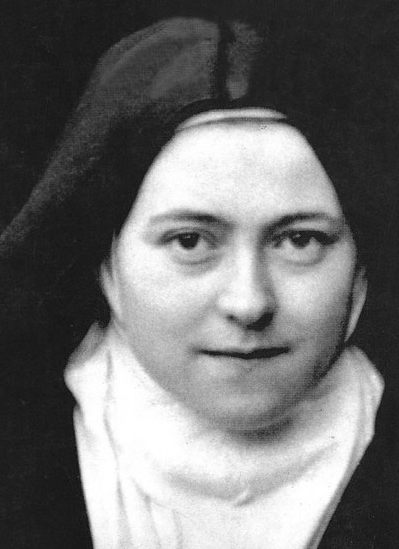 Dearest God, Jesus Christ, Holy Spirit and St. Therese. God, I am sorry if my heart is filled with hatred. I want to forgive those who cause me hatred, but how can you forgive if they never ask for forgiveness and keep hurting me over and over again. My situation at home with my so-called family is causing me so much stress and depression. It is affecting my health really bad. I am tired of how I am being treated by the people who supposed to care for me, yet they make my life miserable over and over. I can’t stand them anymore. My mom, brother and his fiance. They have been really mean and cold to me for so many years. I am tired, my Lord trying to be patience with their attitudes toward me. I am a sinner but I am not a bad person to the point where I should be treated the way the treat me. I don’t deserved the way they treat me. I have many dreams in life, yet my situation right now with my family causing me so much stress. My head hurts most of the time. I feel sharp pain in my heart. I don’t breathe normally. The situation in our home is abnormal. My mom tolerates my brother and fiance will all their wrong doings. My brother and fiance are very wise people. They can’t humble themselves. I work hard and pay rents but not comfortable at home. The fiance doesn’t pay anything and causes troubles, but they’re on her side. Me? I did everything. I was the only one in family they can lean on financially because my brother and fiance are super wise, yet when I am the one in need, they don’t care at all. God you know everything I am going through. I don’t know Lord anymore. I am just tired living with these people. Help me, Lord. Amen. St theresa please for me that God will forgive all my sin and wash me with the blood of our Lord Jesus Christ i feel sorry for myself and i believe God will answer my prayer.pray for i may have financial break throught,St Theresa for to get suitable job to be able to support my family,pray for me that the father of my kids will come back to the children and start living with them i pray that he love and care for them ,pray that the woman who make him leave and she is trying to live with him she will not make it with to live with him in Jesus name she destroyed my family.my husband normally come home to see kids so please God hear our pray we need him back home kids need him badly i know that woman has already have kid with him but st theresa pray for us that justice for my kids en the wilk of God will previl we pray this woman will be defeated for destroying our happyness,joy,and our unity en love she all this but thro the power of Jesus i trust him that my husband will come back home my kids need a full time dad not apart dad i pray this trusting in Jesus name.st theresa pray for wisdom,knowledge,understanding,good memory en forcuse since i want to go back to school to Ot i want my brain to be sharp thank Jesus en St theresa. St Therese, Our prayer for this Novena is that we can sell our current home in Abq and be able to be reunited with my Husband in California with finding a new home for a good price so I can be a stay at home mom. Please pray for my marriage to be restored and all marriages to be restored. Please bring my husband and son back to Jesus. Thank you.